This year, Sarah and I spent two weeks off the coast of Dubrovnik, on Koločep island. We'd never been to Croatia before, and I was a little nervous that if there wasn't much to do on the island, we wouldn't be able to get elsewhere particularly easily. I needn't have worried: We thoroughly enjoyed our stay. It might even be my favourite holiday so far. 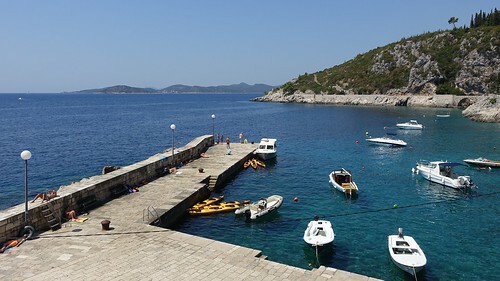 We did travel around a bit: twice to Dubrovnik's old town and once to a botanical gardens in Trsteno but there was also loads to see on the island itself. One of our favourite trips was simply to a cave on the opposite side of the island known as a "blue cave" because you looked like a Smurf on the inside. We had to jump into the sea from the boat and swim into and out of the cave before continuing on our trip. Simply puttering about on the boat, either around the island or to Trsteno was a great experience in itself. Our guide Sammi was very friendly, the weather was great and swimming around or just enjoying the sun on the back of the boat was enough for me to want to check property prices out there. On Koločep island is a little restaurant called Villa Ruza. We managed to eat there twice during our stay. I think it is considered to be one of the top ten restaurants in Croatia. It's one of the best places I've ever eaten in my life. In terms of price, it was about half that of restaurants in Dubrovnik itself. Dubrovnik itself was, quite predictably, much busier than Koločep. It is a stunningly attractive old town. On our second visit we took a tour. There are a variety of different themed tours that you can take, including Game Of Thrones sight-seeing tours, and there were Game Of Thrones tat shops all over the place. We opted for A Story About The War. One thing we love to do when visiting foreign places is to get an idea of what life is like for people there, and this war was not all that long ago - I can remember the news coverage from the time. We were the only two people on that particular tour, so we had a fairly tailored experience. I wish I could remember our guide's name. She was the same age as us and grew up as a child in the city when it was under siege. Her personal story included details about where her family stayed; what life was like for kids growing up at the time; how people got supplies; which areas were badly affected and much more. It was a very heartfelt tour and gave us an intimate and personal portrait of what life was like for people there at a time that most tour operators tend to prefer to ignore. This was exactly what we were looking for. Sarah and I were both a little teary at the end! We tried to do things a little different on this holiday. Normally we keep ourselves to ourselves and don't socialise much with other guests. We also rarely do trips and excursions, preferring to sort things out for ourselves. This time we made an effort to be more sociable and I'm glad we did because we met some really nice people. The trips we did were great fun and on the last day I blew through most of the rest of our currency by hiring a jet ski for half an hour. Those things are FUN. Top speed on the one I was using was 57 land mph. Every muscle in my body was screaming for a few days afterwards! Often on a two-week holiday we reach a point around 10 days where we've pretty much had enough. This time around I could have stayed for twice as long. This was the first proper test of my new camera and I've uploaded a set of photographs from our holiday to a Flickr gallery. Sounded fantastic! We miss you guys. I love those big rocks, those rocky beaches and clear and not at all shallow sea, I love that smell of conifer trees in the hot summer and they are everywhere! It's an adriatic jewel. Prettiest coast I've ever seen, I've never been to any island though.